Is it time for your vacation, but you aren’t sure where to go? Do you have a stack of brochures of really great places to go, but you really haven’t made your mind up yet? Did you know that there is a beautiful country with stunning beaches that is the perfect place for your vacation? If you really want to have a memorable time for your vacation, then you need to look into going to Mexico. Here is more information on the 5 beaches worth visiting in Mexico. Playa Delfines: This beautiful beach in Cancun, which also goes by the name El Mirador, is a popular beach. There are no resorts attached to this beach so it’s very peaceful and quiet. At the El Mirador, you can relax in the sun on a nice chair and read or go for a swim in the beautiful blue water. Playa Norte: To get to this beautiful beach, the first thing you will need to go is hop on a ferry that is going to make a stop at Isla Mujeres. Once you make it to the island, Playa Norte is just a short walk from the ferry. There are a lot of ways to relax here at Playa Norte like going to the beach club or just relaxing under a palm tree and enjoying the sea air and beautiful water. Playa Mamitas: Though you are in Mexico, do you want to go someplace that has a little taste of Europe? Then Playa Mamitas is the beach you want to check out. Located in Playa del Carmen, Playa Mamitas has a beach club you can hang out in or you can enjoy a drink down on the beach right by the warm water. Playa Isla Blanca: Do you truly want a tropical getaway? If you are interested in a secluded beach that does not even have a way to get there other than a car, then this is the right beach for you. Located north of Cancun, this beach might be a little more effort to get there, but it is so isolated and stunning that the drive is worth it! 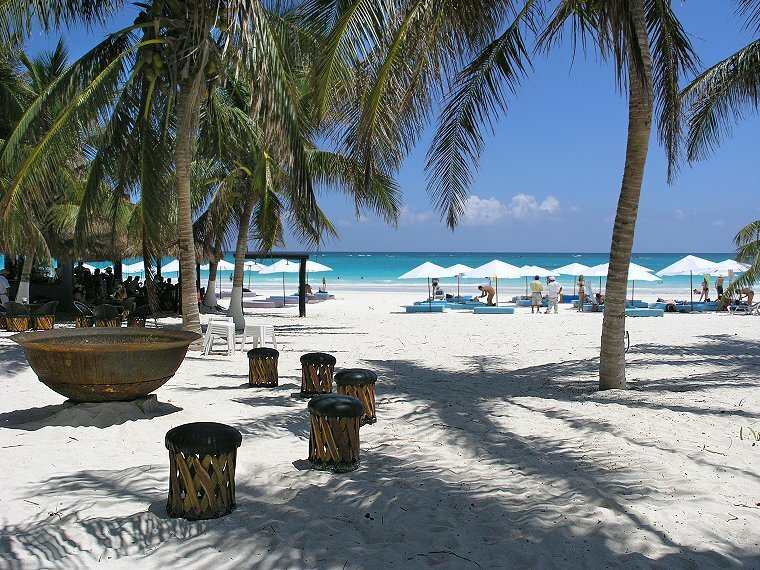 Tulum Beach: This beach might be considered to be one of the most gorgeous in the world. Tulum Beach is south of Cancun, and there are a few hotels and cabanas that are available to rent. If you ever pictured yourself in paradise, then Tulum Beach is your paradise on Earth. Mexico is a beautiful country with wonderful places for tourists to visit. If you really want to have a great vacation then check out the beaches in Mexico. There are five of the best beaches in the world in Mexico, and you can relax and have a great time hanging out in the beach clubs or just having a tropical drink by the bright blue water.